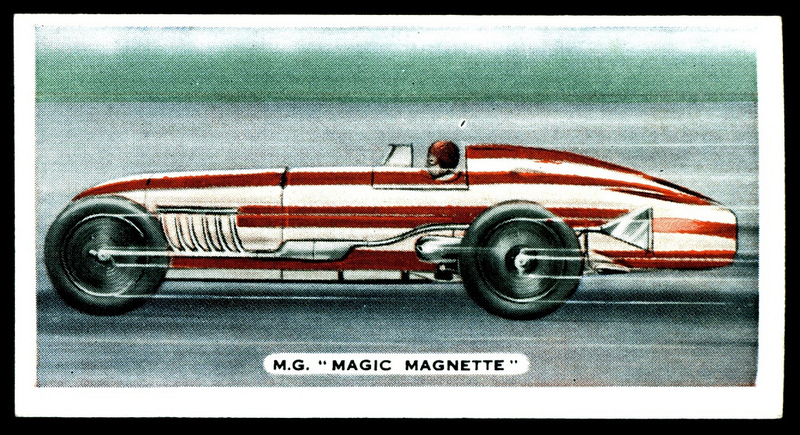 I am not sure if all of you are aware of the fact that the 23a Racing Car from late 1934 and the 23p Gardnerâ€™s MG Record Car from late 1939 are in fact based on one and the same record car, the famous MG EX 135, the â€œMagic Magnetteâ€ or â€œHumbugâ€, a six-cylinder MG Record car used by no lesser man than Capt. George Eyston in 1934, and then, after having been re-bodied and equipped with a new engine, by Maj. â€œGoldieâ€ Gardner, before and after the war. A nice-to-know background information on these two famous Dinky record cars, I think. Thanks for all these remarks and pictures. Now, there is one picture/remark I can not agree with: the one in the middle, showing the open wheeled MG record car. Your picture shows the MG Magic Midget, the smaller 4-cylinder car from 1931. 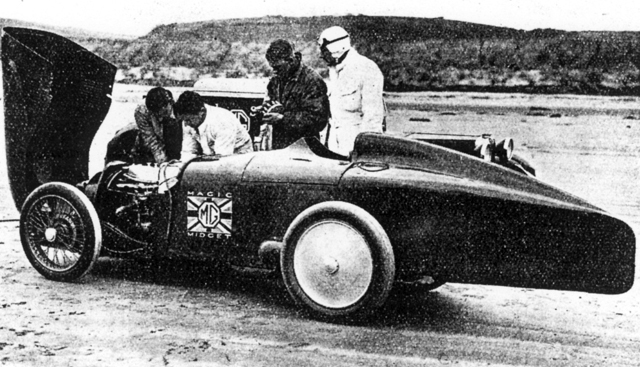 This car formed the basis of the 23 Racing Car, not the 23a RacIng Car. 23a is formed after the MG Magic Magnette or Humbug, from 1934, with a six-branch exhaust system. Thanks, Walter, for your comment and correction! You're the real expert. It's a fascinating subject after all, this pioneering prewar record breaking scene and its reflection in model cars. Yes, Jan, it certainly is. And amazingly, the cars of Captain Eyston always had a preferred status within the model-policy of Dinky Toys. It started with the 23 Racing Car, then the 23a Racing Car, then the 23b Hotchkiss, then the 23d Speed of the Wind, then the 23m Thunderbolt, all Eyston's record cars of the glorious 30ies. He certainly must have had some shares with Meccano, don't you think? Even the little 35b Racer was raced by Eyston, on a number of occasions! The pre-war 23p model has a baseplate stamped with the name "MG Magnette" which seems to be a mistake by misunderstanding. The MG Humbug, based on a K-Type MG with the inline-6 KC supercharged racing engine, was dubbed Magic Magnette, following its evolution from the Magic Midget racers based on C and M-type models. Eyston's Magnette, EX135, had a racing shell represented in the Dinky 23a (Humbug), before MG pulled out of racing, whereupon the car was sold to Gardner who continued to develop the components and clad the chassis in a Reid Railton designed body, represented by Dinky 23p. However, I cannot find any evidence that Gardner continued to refer to the modified car as Magnette, although he still allowed that it was prominently badged as an MG on the Railton exterior. In other words, the car ceased to be a Magnette when Gardner took possession. 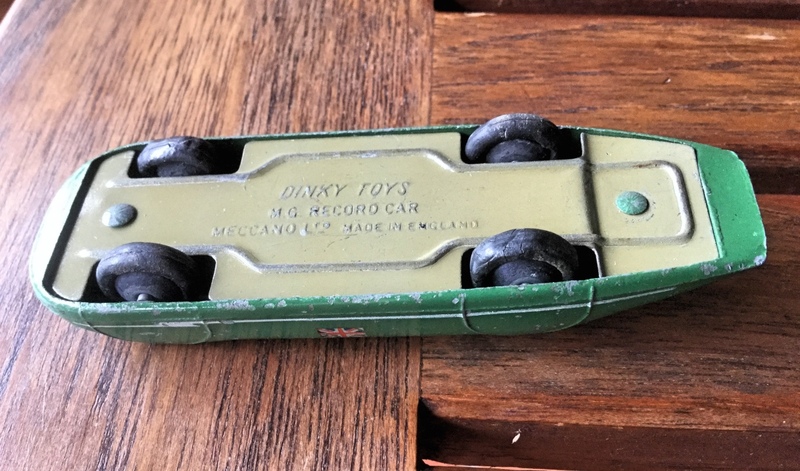 The records set up by Gardner were in May/June of 1939 with the Dinky Toy appearing in a souvenir single box that noted the achievements and was advertised from September 1939. So a quick turnaround from production to shipping - but perhaps haste makes waste. Note that the 23p box avoids calling the model Magnette - perhaps it was a correction easier to make on a printing plate than on thousands of stamped pieces of tin. Al---I certainly do not have much expertise on this, but what you are saying makes a lot of sense, and is probably true.....especially since the box had it listed differently. On a side note, I was always a little surprised that Dinky did not make a model of the MG Magnette sedan from the mid-1950's......it was an attractive car and would have made a nice model. 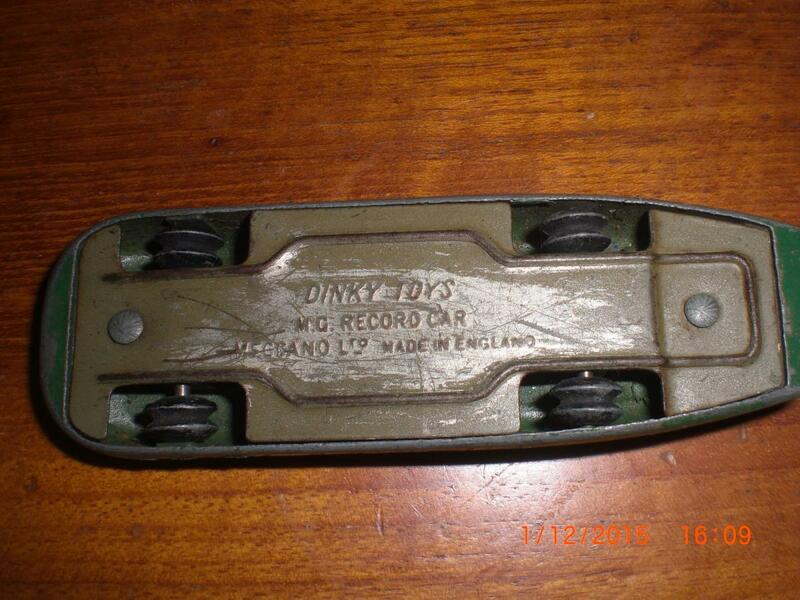 Does Dinky 35c represent the N-type MG Magnette ? They look very similar. Wasn't it the case that post war MG's fell into that BMC pool of badge-engineered Morris/Austin/Wolseley/Riley motors? Perhaps the interchangeability put off Meccano from producing ranges of cars that were all really the same apart from the odd tailfin or slightly different shaped radiator? 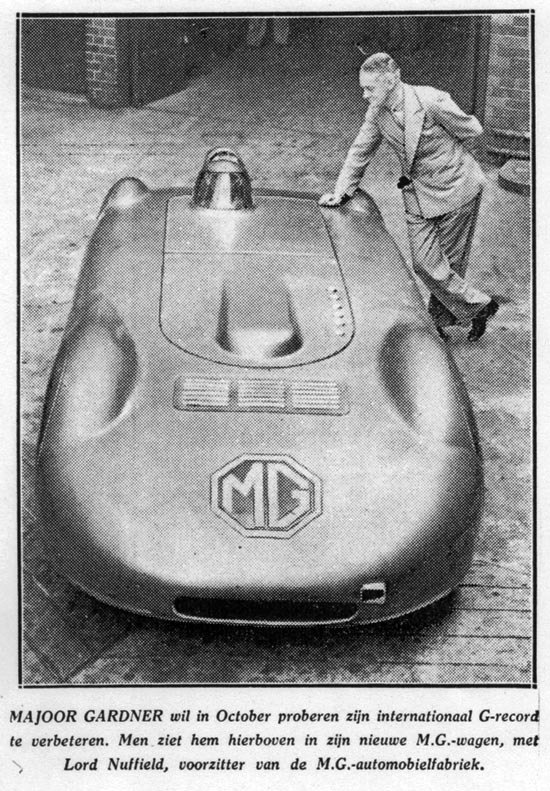 I looked back at the Meccano Magazine in 1939 to note that even there the Gardner MG is never referred to as Magnette. Production on the model struggled (we only assume it was entirely to do with WW2) and the September release was delayed to December... and maybe even to January 1940... and never spoken of again thereafter. To quote the editor "... production has been unavoidably suspended until now. Readers will remember that this car is a reproduction of the one in which Major ATG Gardner set up new world speed records..." The editor glossily notes some features of "this (nameless) car" while the advertising quietly indicates that the price has risen from 10d to 1/-. 1. It is a post-war issue, modified with a re-colored base-plate in a highly professional way, not recognizable even for a trained eye. In this case the question remains as why this was done in the first place and with a color quite different to the one used on the pre-war M.G. MAGNETTE. It would not really have increased the value of this model, would it? 2. It is a very late pre-war issue with a "rectified" base-plate, carrying the correct name M.G. RECORD CAR. After the war, the color of the rectified base-plates was then changed to black for all the post-war issues. Walter, I would lean toward your second theory. I think it very possible that Meccano decided to change the baseplate very late, and some were made before production was shut down for the war. The late issue with altered base theory seems like a convincing explanation to me. Those are the domed pre-war rivets not the dimpled post-war variety and the colour looks completely consistent with the pre-war finish. I'm not convinced that someone would try to fake something like this and I'm not aware there has been any wide speculation over the name change anyway. While production of many models was interrupted in September 1939, the Meccano Magazine announced resumed availability in March 1940. The new 38 series seems to have been the leading casualty. In later months, models in the 39 series reappeared into the advertising and, actually, 23p also slipped back into the roster briefly in August/September. Perhaps by this time the baseplates had been changed - but it this is would have been very near to the end of production. Magnette, I assume, would be a marque name that MG would want to retain for itself - and it did indeed eventually use the name again. Gardner was not himself a part of the MG team and the company had pulled out of competition. But, anyway, whatever remained of the EX135 K3 Magnette car, it was significantly modified and buried under the Railton body, and hardly the same thing any more. Eyston had driven the Magnette in its humbug incarnation to 127mph, but Gardner was now ramping the machine over 200mph. Thanks, Terry and Al, for your comments. It would be interesting to learn if there are other late prewar 23p MG RECORD CAR around with such a baseplate or if my example is "unique". It will be interesting to see if any othes surface.....that would clinch this explanation. In reality, this could be a quite rare variation, with very few made before production was shut down for the duration of the war. Silver MG RECORD CAR base plate, round smooth rivets, prewar hubs, white flashes too. After mine (see above), this is the second model with such specs I have seen so far. So it seems to confirm Terry's and my assumption that - after the first model with MG MAGNETTE base plate - there was a second pre-war issue with MG Record Car base plate before production shut down for the duration of the war. This definitely confirms the existence of a late prewar base plate MG Record Car, golden-brown lacquered.